There has been some recent rediscovery of the Sicilian painter, Michele Ragolia (also Regolia); there were exhibits with published catalogs in Bari (1983), Padula (1990) and Agerola (1990). As far as I know, however, there have been no such exhibits in Naples, though that is where a number of his works may be seen separately at different sites. Regolia is considered a "minor" painter of the Neapolitan Baroque. That period lasted from the late 1500s to the mid-1700s and included such artists of note as Battistello Caracciolo, Massimo Stanzione, Andrea Vaccaro, Luca Giordano and Francesco Solimena, to name but a few. (See Some Painters of the Neapolitan Baroque.) If that is your competition, then maybe it's not a disgrace to be "minor." Ragolia was born around 1625 in Palermo in Sicily; his presence in Naples by 1632 is documented. He died in Naples in 1686. He started out as an apprentice to Belisario Corenzio (c.1558-1643) in Naples and his early work displays the artificial refinements of the style known as "Mannerism," a style that valued elegance over realism. That changed, of course, with the explosive Michelangelo Merisi (1571-1610) (called "Caravaggio" after the town of his birth), one who (according to his critics) abandoned beauty for mere likeness." Whatever the case, Caravaggio lived in Naples for the last few years of his life, and his intense depictions of not just the physical but the emotional in renderings of the human form changed the way artists painted. Generations of painters were influenced; virtually all the painters of the Neapolitan Baroque came under the influence of Caravaggio's realism. Ragolia's work, too, changed over time under that influence, and he had a solid career of 50 years in Naples and the surrounding area, even though we still call him "minor." 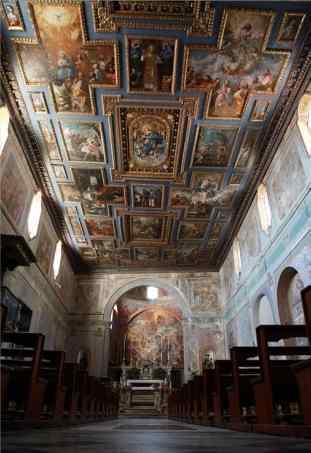 His work in Naples includes frescoes on the large vault of the chapel of the Crucifixion in the church of San Domenico Maggiore and, at least, the series of Stories of St. Francis of Assisi in the church of San Diego all’Ospedaletto. 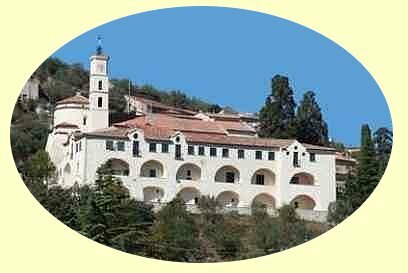 (The Stories of the Blessed Virgin on the same premises have been attributed to him as well as to Battistello Caracciolo.) The sacristy of Pio Monte della Misericordia has his paintings of The Meeting of Jacob and Rachael and The Triumph of David. Ragolia's Madonna del Carmine is in the church of Santa Maria della Sapienza; and his Madonna and the Saints is in the church of Santa Maria Regina Coeli. Some of his output is held privately and even in museums abroad, such as the Harrach Gallery in Vienna. Ragolia's most impressive efforts are, however, outside of Naples. This accounts for the attention given to his work elsewhere in Campania, especially in the Cilento area, in the province of Salerno. His best-known work is in the Sanctuary of Sant' Antonio da Padova (top photo) in the town of Polla(#9 on this map) The entire ceiling (photo, right) is carved, gold-trimmed and inlaid with 40 canvases, all of them by Ragolia. The ceiling is dated 1666, presumably the year when the last of the paintings was finished. The overhead display is reminiscent of the ceiling of Santa Maria la Nova in Naples. The paintings are of different sizes and depict scenes from the Old and New Testaments as well as images of various saints. It is a one-man art-gallery that shows the artist at the height of his expressive powers. He had already been active in Naples and the provinces by the time he did these paintings and they show the effect of the Caravaggist climate of the times. They had a great influence on an entire generation of later painters from the area of the Cilento and Vallo di Diano well into the 1700s. The paintings have been restored recently.